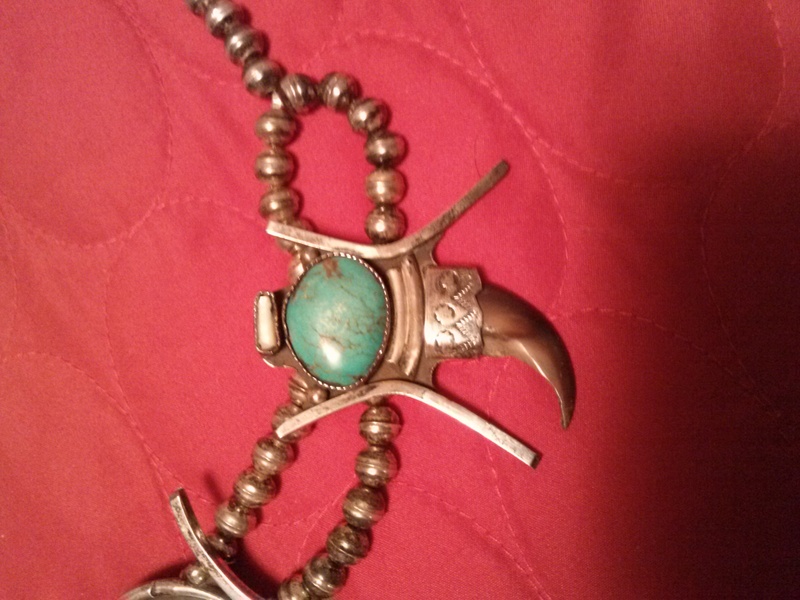 I have a man’s antique Indian Necklace which came into my family’s possession about 1960 in Cody, Wyoming. 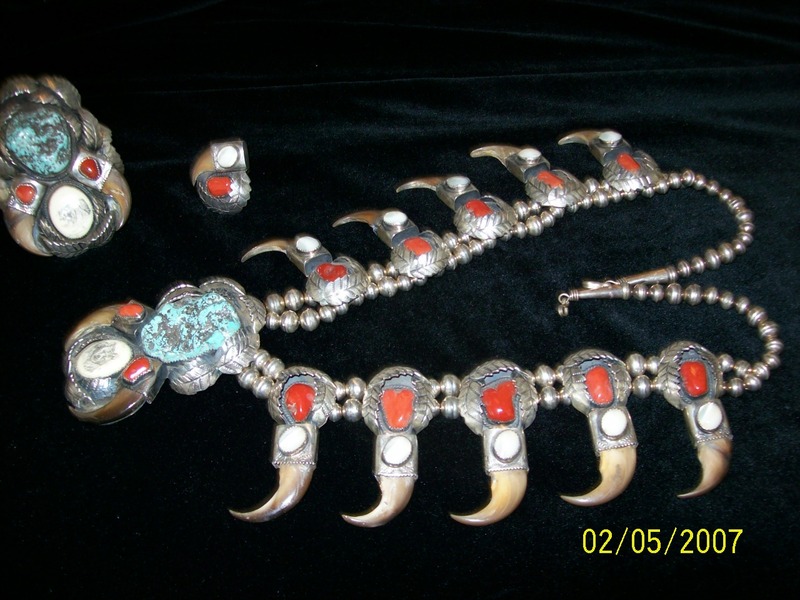 It has sterling silver, blood coral, turquoise and bear claws. 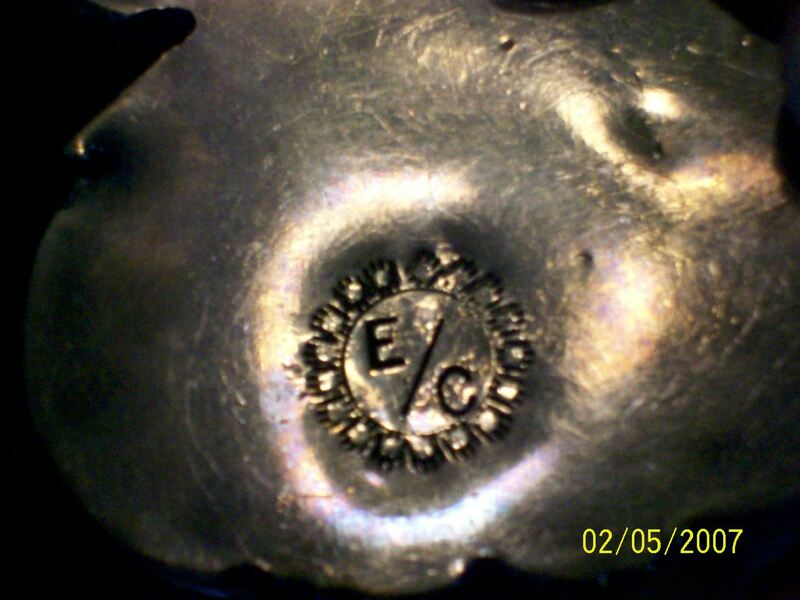 The designers hallmark is E/C inside a circle. 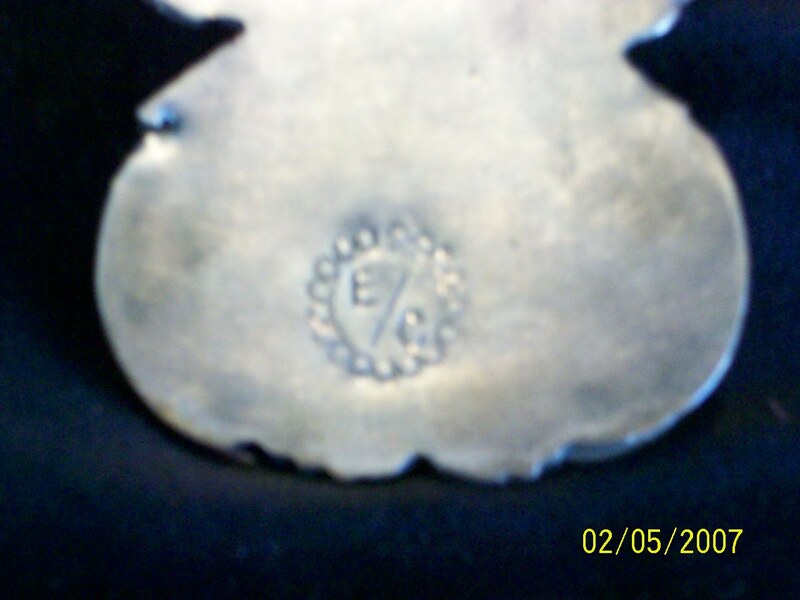 Thank you for any help in finding the designers identity. I’ve checked all my resources and did not find this hallmark. Perhaps another reader recognizes it and will post a reply here. What a GREAT necklace you have in your family – it is just handsome, gorgeous, beautiful ! The turquoise is excellent, the coral pieces stunning, the Mother of Pearl accents perfect. Although constructed in the squash blossom style (associated with the southwest cultures), the scrimshaw pieces are not typical of southwest Native American artists so this leads me to think of my days in the Pacific northwest and Alaska when I saw pieces more like this. As to its Wyoming connection, I am curious. Do you have any more information surrounding the acquisition in 1960? Bear Paw or Bear Claw? Necklace or Pendant? 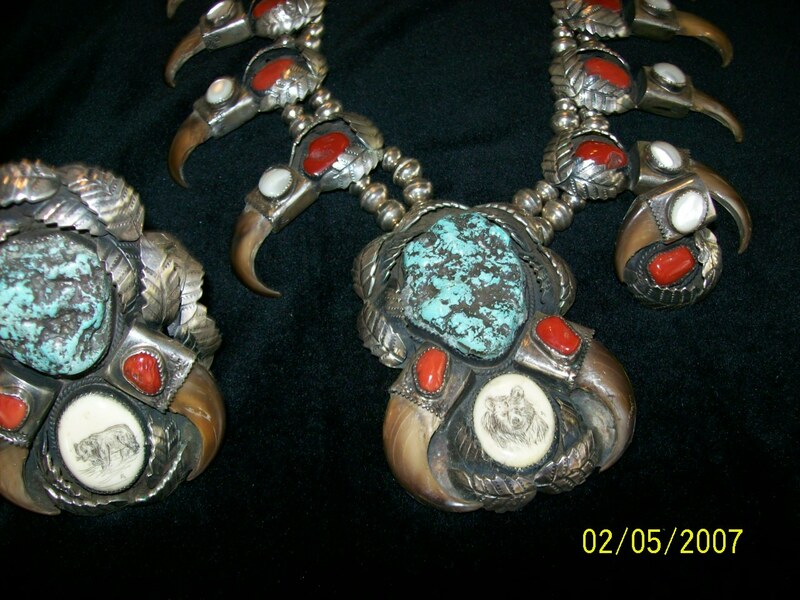 I am looking for a bear claw necklace. 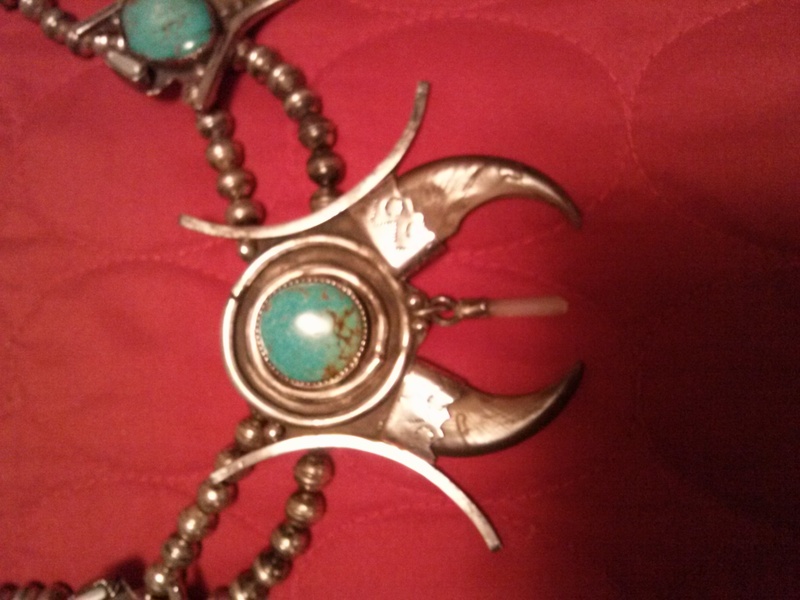 I saw you had one for sale ( bear claw, sterling silver and turquoise and coral, leaves and rain drops.) I would like to see if you can make one for sale like that one. I’m not sure exactly which item you were looking at. If you would like to send a URL of the page where the item was sold, that would be best. But in the meantime, here are a few definitions of how terms are used when referring to Native American jewelry. My husband says it is a girl thing to know what these things mean and boys often use the wrong terms ! Just so we are talking about the same thing here………. A pendant is a separate piece that is hung on a chain, collar, beads or leather thong. A necklace is a complete unit that encircles the neck- it may or may not have a central piece or pendant. A bear claw pendant or necklace is one made with a bear claw (real or faux) or out of other materials in the shape of a bear claw. A bear paw necklace or pendant is made in the likeness of a print of the bear’s paw. Now as far as your last question – can we make a specific one for you? We don’t make any jewelry here. 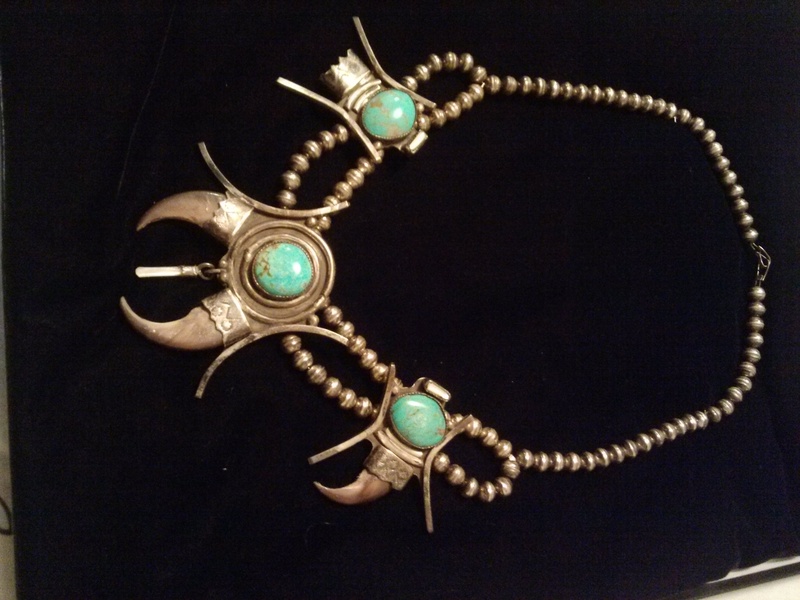 We purchase all of the new items we sell from Native American artists who make the items. Here’s how that goes. The artists tend to gather their materials in the fall and work over the winter on their jewelry. In the early spring, they start offering what they have made for sale. We make several trips during the spring and summer to purchase what we need for our store. As far as special order items, when we first opened our web store, we took a few special orders but in 95% of the cases, either the item was not as expected, it took too long to make, or the customer changed their mind. The stone was the wrong color or size, the bracelet was too big or too small, the necklace was too long or too short………So we no longer take any special orders. But it is always a good idea to keep an eye on our new page and the Pawn Shop where we add items daily and we never know what is going to come into the Pawn Shop. You can go to the Pawn Shop or the New Page by clicking the appropriate photo.